Runner up to Bitcoin, Ethereum is not as much a digital currency, but aims to become a better smart contract platform. It will in time help us evolve distributed, and safely implemented interactions between many parties. Where big nodes of control like Google and Facebook and banks are now the norm, public Blockchain implementations will make trust a given where today trusted third parties are still needed. A word of caution though: on top of the platform it is still possible to implement new currency schemes, that are currently used for so-called Initial Coin Offerings, a form of capital raising scheme that is slightly reminiscent of crowd-funding. Still though, you are talking about you putting up real cash for a promise that you will receive something from that project in the future. Failed projects happen however, but proper smart contracts implementations would be able to ensure that a failure has a built-in recovery that repays the participants in case of failure, so that "take the money and run" would be difficult. 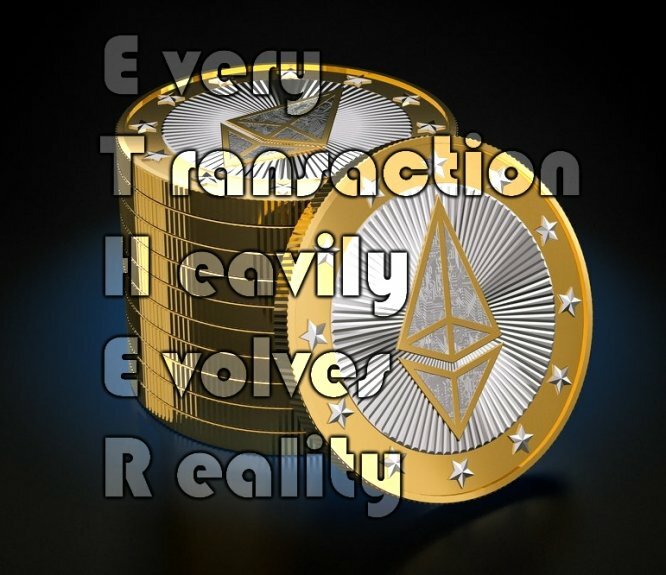 Ethereum is thinking further than that though, and aims to become "Web 3.0": a fully distributed internet that does not forget data, and promises to keep data in the hands of those who own it. The fact that I am authoring these Acrosstics would be traceable, as well as the fact that I used images from the web to make them.